As we were all celebrating our Thanksgiving holiday, members of our armed forces were keeping us safe around the world. The U.S. Navy was kind enough to share a photo and story about one of Louisville’s military heroes who willingly serves to keep us free. We are truly thankful for Aaron, and all members of the U. S. armed forces, and their families, for the daily sacrifices they make to keep us safe and free. 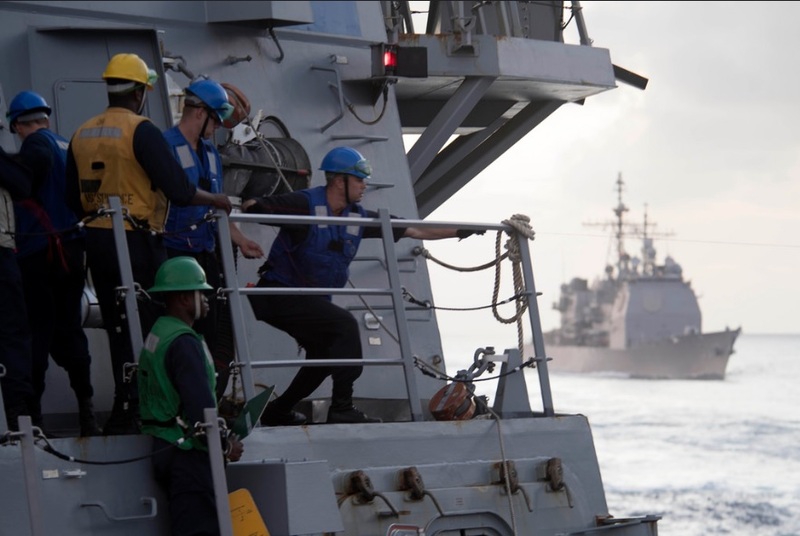 PACIFIC OCEAN (Nov. 23, 2018) Boatswain’s Mate Seaman Aaron Tierney (right), from Louisville, Kentucky, heaves in a shot line aboard the Arleigh burke-class guided missile destroyer USS Spruance (DDG 111) to begin rigging for a replenishment-at-sea with the dry cargo and ammunition ship USNS Charles Drew (T-AKE 10), as the Ticonderoga-class guided-missile cruiser USS Mobile Bay (CG 53), background, cuts through the Pacific Ocean. Spruance and Mobile Bay are underway conducting routine operations as part of Carrier Strike Group (CSG) 3 in the U.S. Pacific Fleet area of operations. The USS Spruance (DDG 111) is an Arleigh Burke-class guided missile destroyer with the United States Navy. Spruance’s keel was laid down on 14 May 2009. Spruance was christened by the admiral’s granddaughter Ellen Spruance Holscher on 5 June 2010 in Bath, Maine at Bath Iron Works. The completed ship left Bath on 1 September 2011 for her 1 October 2011 commissioning in Key West, Florida. 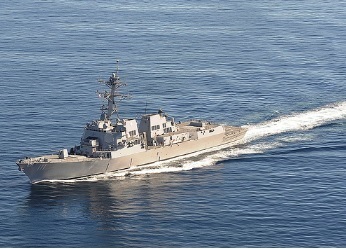 After commissioning she arrived at her home port of San Diego on 24 October 2011. In March 2012 USS Spruance, during its eight week Combat Systems Ship Qualification Trial (CSSQT), set an Aegis record when it intercepted a long-range air target at the furthest distance in the history of the Aegis and Standard Missile program.